Chelsea Football Club's home ground is the 42,360 capacity Stamford Bridge football ground in South-West London. FC Chelsea tickets will bring you a club that have won five league titles, seven FA Cups, five League Cups and two UEFA Cup Winners' Cups! Chelsea is a top club and a must-see for every football fan! In 2012, Chelsea owner Abramovich fulfilled his ultimate dream by winning the Champions League. Last season Chelsea finished in 1st position and qualified for the Champions League. Can the Blues bounce back to be on top of the English football once again? With world class football players like Cesc Fabregas, Eden Hazard, Gary Cahill and others, Chelsea FC looks hard to beat! Buy your FC Chelsea tickets to see an exciting Chelsea football match at either Stamford Bridge or away. You will experience the true English football atmosphere! The best English Premier League tickets are available at 1st4Footballtickets.com. Browse our ticket inventory and book your tickets securely online. 1st4 Football Tickets can provide you with FC Chelsea football tickets to all matches including Chelsea top matches for the Premiership, English FA Cup and Capital One Cup. With top players like Diego Costa and Eden Hazard, Chelsea is one of the top favourites for winning the Premiership title during the 2017/2018 season. Browse our website or call our Chelsea Ticket Hotline for match tickets like Chelsea v Arsenal, Chelsea v Tottenham and more Chelsea Tickets. Besides Chelsea home tickets and Chelsea away tickets for the Premiership and all other league where the Blues are participating. Do you want to visit a match at Stamford Bridge? We have the best tickets for the Premier League, FA Cup, EFL Cup and several European cups. Book your football tickets securely online through our safe booking system. We will make sure you will never forget the amazing experience of attending a match at Stamford Bridge. 2018-2019 is for Chelsea the season to bounce back from a tough 2017-2018 season. The Blues finished fifth last season, this means they will play in the Europa League this season. So, they can focus on winning the Premier League this season. Antonio Conte is Chelsea’s manager since the summer of 2016. It’s up to the former Juventus manager to show why Chelsea did everything to sign him as their new manager. He did an amazing job for both Juventus as the Italian national team. Book Chelsea tickets on 1st4Footballtickets.com and see how Conte’s Chelsea is fighting for the Premier League crown. The Italian manager created a very strong squad. His squad contains the perfect combination of strong defender (for example: Gary Cahill and Andreas Christensen), the best defensive midfielder (N’Golo Kante), creative midfielder (Cesc Fabregas and Eden Hazard) and one of the best strikers in the world (Alvaro Morata). Conte should be able to play for the Premier League title with this strong squad. The combination of this strong squad with a price winning Italian manager should be a guarantee for some exciting matches at Stamford Bridge. Visit a match of Chelsea to see this amazing combination of qualify players and staff live at Stamford Bridge! The Blues collected their first trophy after their first 50 years without important silverware. After winning their first trophy, they haven’t been another 50 years without a price. They are six times Premier League champions and two times champion of the Second Division. Chelsea also won 7 FA Cups between 1969 and 2017, 5 Football League cups and 4 FA Community Shields. Besides these domestic trophies, the Blues also collected some European silverware. They won 2 UEFA Cup Winners’ Cups, 1 UEFA Champions League and 1 UEFA Europa League and finally one UEFA Super Cup. In order to win more trophies, the Blues needs your support! Book your Chelsea Fc tickets online on 1st4Footballtickets.com and support your time live at Stamford Bridge. This is the only way for the club to extend their trophy cabinet. Every teams needs the support of their biggest fans to win trophies. A good team is never enough for successes. The perfect combination of a good team with loyal fans is the golden formula for silverware. Chelsea Football Club was founded in 1905 by Gus Mears. The club quickly gained a reputation for signing big name players to attracting large crowds. Despite singing a lot of big name players, they failed to win a major trophy in the first fifty years of their existence. The Blues played thirty of their first forty seasons in the English First Division. Although often found themselves finishing in mid-table or battling against relegation. In 1915 the club came close to a FA Cup trophy, when they lost the final against Sheffield United. The lost in the semi-finals in 1911, 1920, 1932 and 1952. Chelsea finally won a major title in 1955. Manager Ted Drake led the Blues to their first League championship in 1955. In 1972 they won their first major international trophy, the European Cup Winners’ Cup. Managers Ruud Gullit and Gianluca Vialli brought the club to a higher level in the late 90’s. The biggest moment for the club came in 2003, when Russian billionaire Roman Abramovich bought the club. Roman Abramovich started his multibillion-dollar business while serving the army. He worked as a street-trader first and then as a mechanic at a local factory. He was selling importing rubber ducks at the peak of perestroika. In 1988 perestroika opened opportunities for privatization in the Soviet Union. This gave Abramovich the opportunity to legitimise his old business. Together with his wife Olga, Abramovich set up a company making dolls. In the matter of a few years his wealth spread from oil conglomerates to pig farms. He also set up and liquidated at least 20 companies during the early 90s. In 1995, Abramovich and Presidents Yeltsin’s associate Boris Berezosky, acquired the controlling interest in the large oil company Sibneft. Each partner paid US$100 million for 50 percent of the company, which quickly turned into billions. Abramovich acquired Chelsea Fc in June 2003. 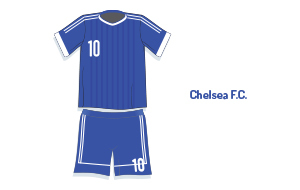 Chelsea immediately embarked on a programme of commercial development, with the aim of making it a worldwide brand on a par with footballing dynasties such as Real Madrid, Manchester United and Fc Barcelona. Abramovich’ wish from the start was to win big trophies with Chelsea Fc. He was willing to invest a lot of money to buy the best players in the world. In his first season as club owner, Chelsea bought 14 players with a total transfer investment of 121 million GBP. This wasn’t enough for winning a single trophy, so they bought another nine players in the 2004-2005 season. With this completely renewed squad and Jose Mourinho as his manager, Roman Abramovich won his first Premier League title as Chelsea owner. He second title followed the next season and in 2006-2007 the Blues won the FA Cup. There still was one big dream for Chelsea’s Russian owner. He wanted to win the Champions League with his club. 9 years after he acquired Chelsea, Abramovich’ biggest dream became reality. Chelsea won the Champions League in 2012-2013 after a thrilling final against Bayern Munich. Chelsea defeated the German side after penalties with 4-3. How can I buy Chelsea tickets? Now you’ve decided you want to visit a Chelsea match at Stamford Bridge, it’s time to see what you need to do to book your tickets. We’ve made it very easy for you to order the best Chelsea Fc tickets. We make it very easy for everyone who wants to buy Chelsea tickets. Our booking system is designed to make it as easy as possible for you to order your tickets. Follow these steps and the best tickets for Stamford Bridge are yours! When you’ve completed your order we will send the order details to our reseller. Our resellers will make sure that you receive your tickets in time before the match. All our ticket orders are 150% guaranteed. We have a completely secured booking system so all your ticket orders are fully secured. You can always contact us by email of through the chat service on our site for all your questions. Our friendly customer service employees are ready to answer all your question and guide you through our booking system. Chelsea is always looking for the best young players. They tend to buy players from all over the world at a young age. Because they can only select 11 players to start in the first team every week, they need partnerships to loan out some players. Vitesse Arnhem is momentarily their best partnership. The Dutch teams has three Chelsea players on loan. These three are on a list with more than 15 Chelsea players who’ve played for Vitesse Arnhem. This makes Vitesse Arnhem Chelsea’s biggest partner. The Dutch team is property of Alexander Chigirinskiy, a friend of Roman Abramovich. Chelsea is well known as a club who buys expensive players to compose a strong squad. This fact makes it even more special that the three players with the most appearances for the club are from their own youth academy. Chelsea youth academy graduate Ron Harris played 795 matches for Chelsea between 1961 and 1980. At the same time, it was his teammate Peter Bonetti who played 729 matches for the Blues. Number three in this list is John Terry. Terry, who still plays for the club, has more than 700 appearances in Chelsea’s first time. He will try to take at least the second spot on this list. Midfield star Frank Lampard is the player with the most goals for the Blues. He scored a total of 211 goals in 648 matches for the club. Fernando Torres is still responsible for Chelsea’s highest paid transfer fee. The Blues paid 50 million GBP in 2011 for the Spanish striker. The rest of the top 5 highest transfer fees paid are still playing at Stamford Bridge. Michy Batshuayi is second with a transfer fee of 33,2 million GBP. N’Golo Kante, Diego Costa and Eden Hazard share the third place with a transfer fee of 32 million GBP. Chelsea’s defender David Luiz is responsible for the highest received transfer fee. Paris Saint-Germain paid 50 million GBP in the summer of 2014. Juan Mata (37,1 million GBP), Romelu Lukaku (28 million GBP), Arjen Robben (24 million GBP) and Ramires (25 million GBP) complement the top five.